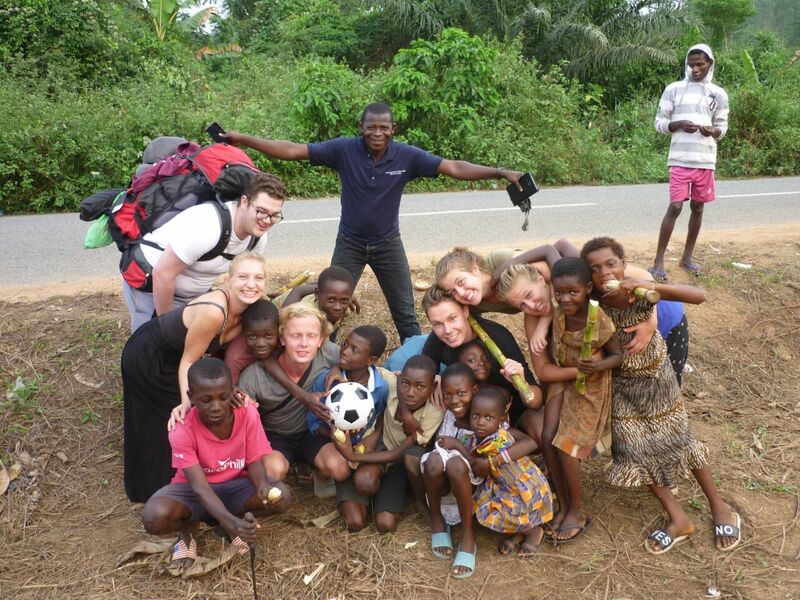 We arrived in Kwesikum in the afternoon around 4 pm. 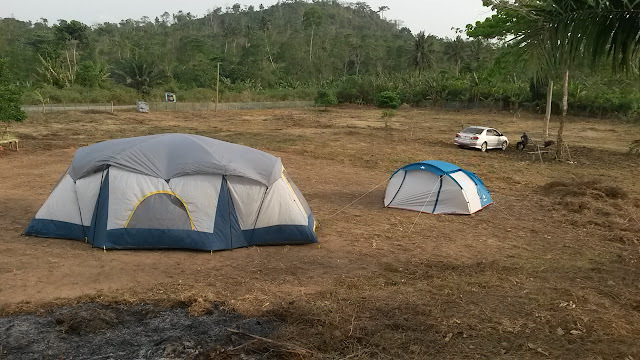 First thing to do was to decide, where to sleep: in one of three tents on the IGI land, in the cocoa house or in a host family. By drawing lots everybody got their place, moved there and prepared their bed. 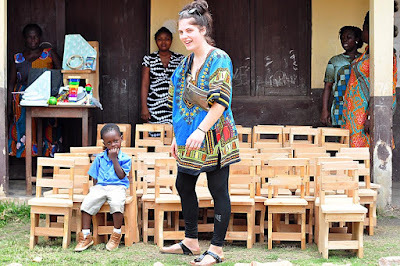 Monday morning we all went to different schools in Duakwa and Kwesikum to work with the teachers and the children. For all of us it was somehow different compared to our work in our projects. We made the experience, that there are serious problems in the schools in the deprived communities like absence of students and teachers or missing school items. 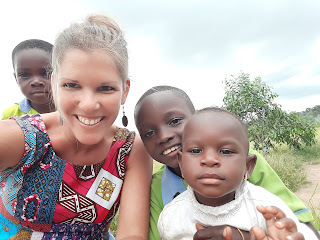 Additionally, a lot of the children did not understand the English language, what made it not easy for us to communicate with them. After returning to the camp site we discussed about our experiences and had supper together. The next days were shaped by work on different farms. 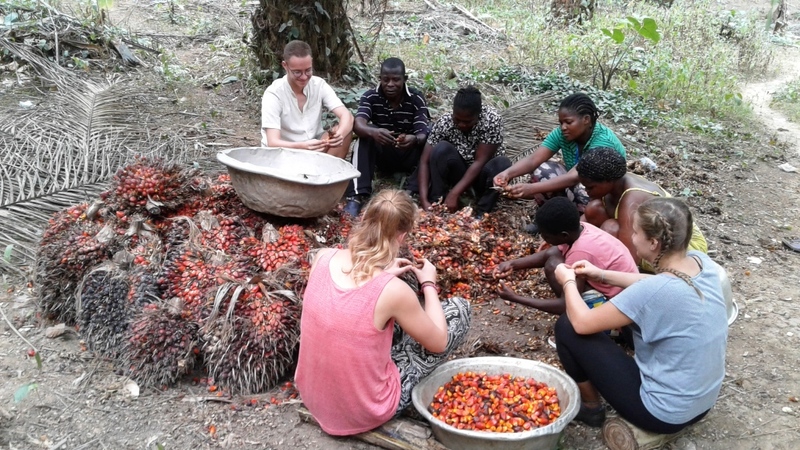 In small groups we accompanied the farmers to a cocoa farm, a palm-nut and orange farm, helped transporting maize and planting of cocoa seedlings. 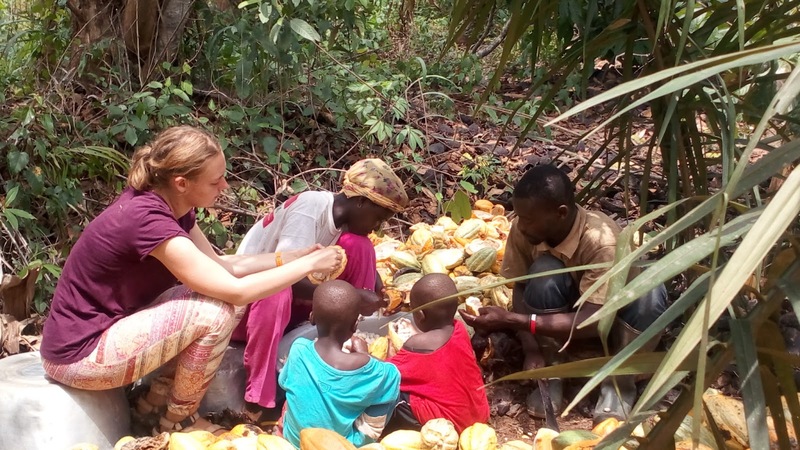 We learned a lot about the farm work, harvested cocoa and peeled the seeds out of it. At the palm-nut farm we peeled the palm-nuts and learned, how the farmers prepare the red oil out of it through an exhausting work. 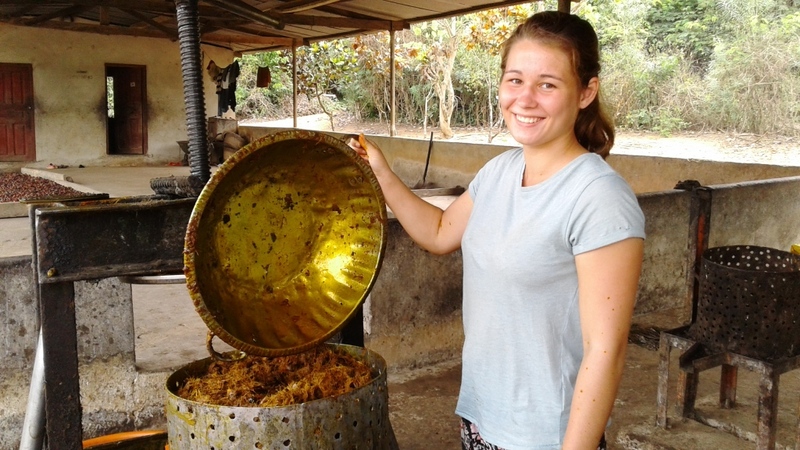 Making all these experiences showed us that the farmers in Ghana are very hard-working people. 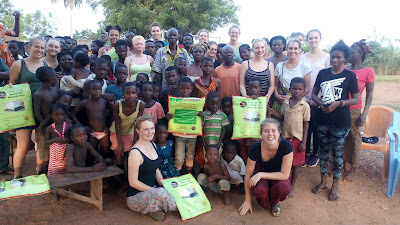 In the evening two of our volunteers held a talk about water-borne diseases on the market place of Kwesikum. 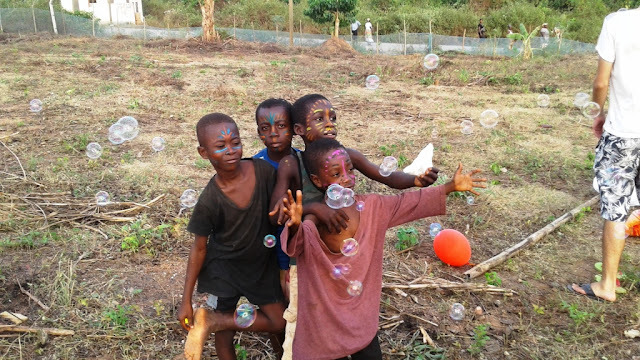 Wednesday afternoon was our kids day: During the week before the camp we prepared a funfair for the children of the community. We invited them and their parents to the IGI-land to play and have fun with us. They could play football, draw, make bracelets out of wool, make a sack race and got coloured make up. 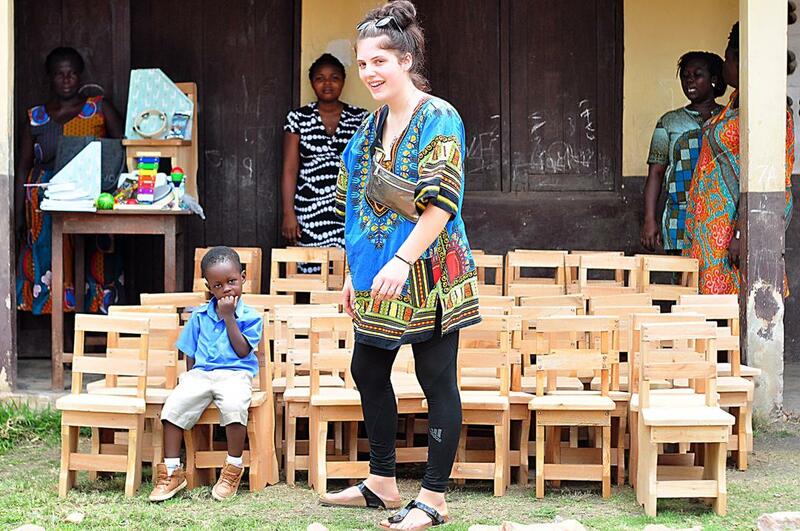 We played music loudly and danced together with the kids. After we finished that lovely funny afternoon we had a bonfire, ate stick bread and sang songs together. 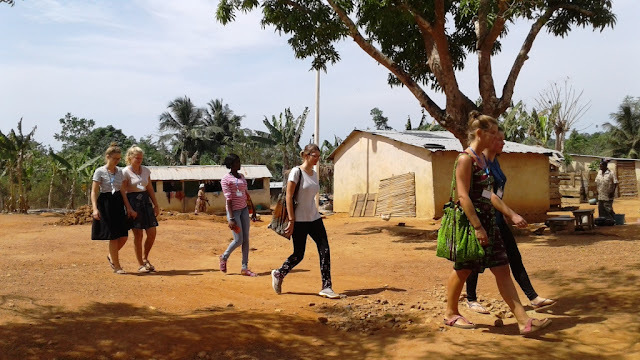 Additionally to the work in the schools and on the farms we also made a familiarisation to get to know the people in the communities and how they live. 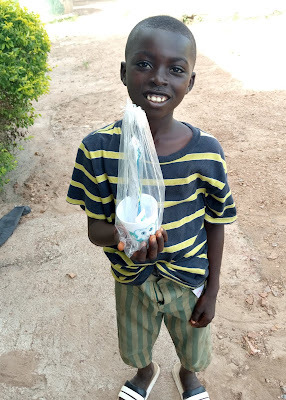 For this, we went to Kokorabo, a small community close to Kwesikum. We spend some there, talked to the people and learned a lot about their life and work. 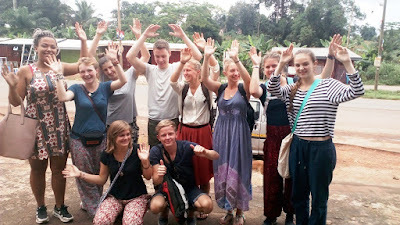 After that we all came together and had a talk about bilharzia and personal hygiene. The people of the community were very thankful for our visit and invited us to eat banana, coconuts and drink palm-wine, which we all enjoyed together. 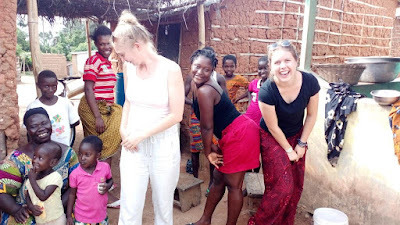 When we came back to Kwesikum another surprise waited for us: some of the men in Kwesikum invited us to prepare and eat Fufu with them, we really enjoyed a lot. 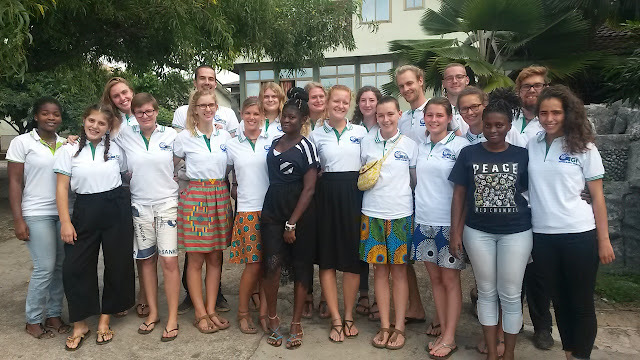 The work-camp in Kwesikum was a great experience for all of us. Here we learned a lot about the life and work in a deprived community. We experienced a week without electricity, flowing water or a real shower and toilet. 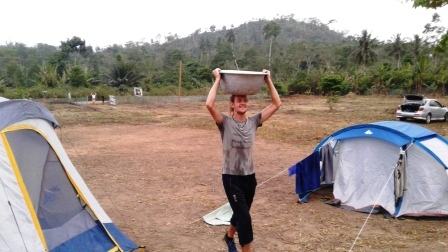 We had to fetch the water for showering on our own and carry it through the whole village - on our heads of course. In the evening it got dark around 7pm and there was no light any more – also something new for us. All in all we had a great time together with a lot of new impressions, fun and hard work. Even our group became closer by working together and helping each other. Volunteering is always a good virtue especially in societies which are deprived. The existence of a volunteer in deprived communities has proven to be an important gesture in the pursuit of development through cultural exchange and knowledge transfer. 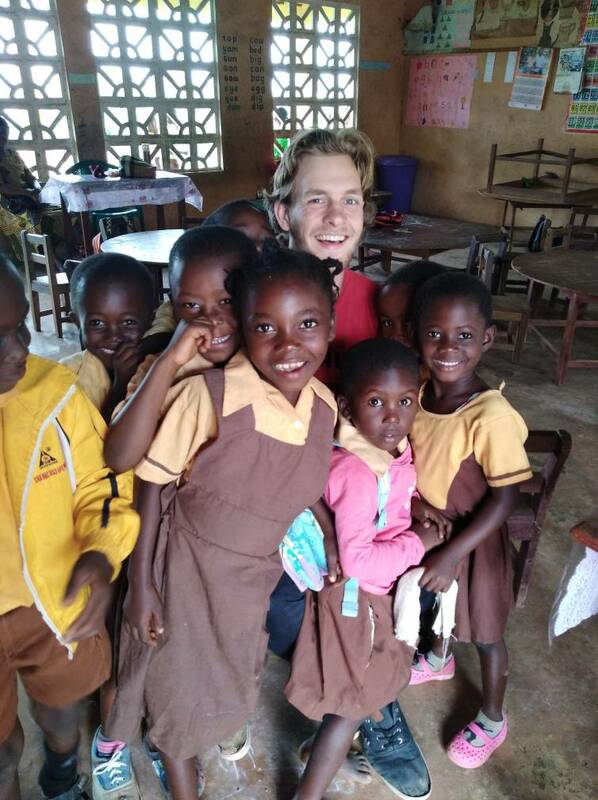 This explains why IGI continues to offer the opportunity for young people all over the world to be part of the project Africa. 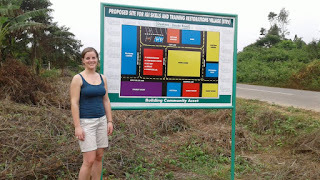 This project Africa is one that is envisaged to improve the fortunes of people living in deprived situations in Africa. 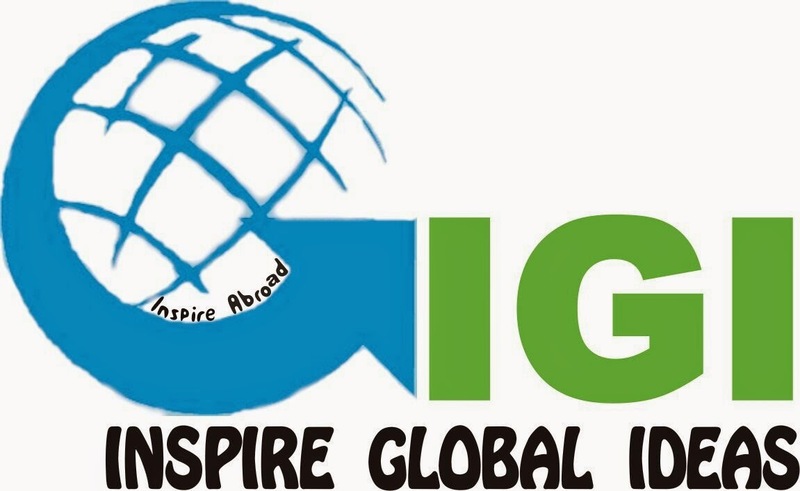 IGI believes that, young people have a lot to offer especially because the future belongs to them. It is therefore prudent to create that responsibility of reaching out to the world to make it better. 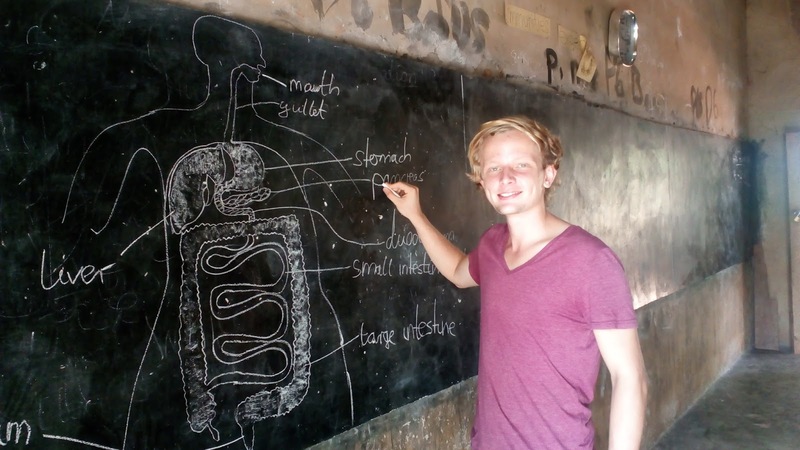 IGI as an NGO continues to offer the young people the opportunity to work in schools, health centres and communities where (volunteers) are needed to fill the gap. Currently, IGI is actively involved in making it volunteering service count in the important sectors of communities. 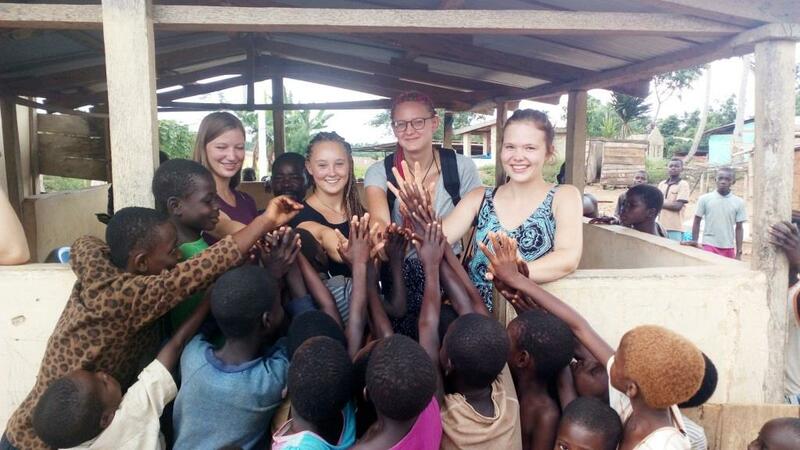 Consequently, the current volunteers who are mostly Europeans are placed in Basic schools in the Central and Eastern Regions of Ghana. 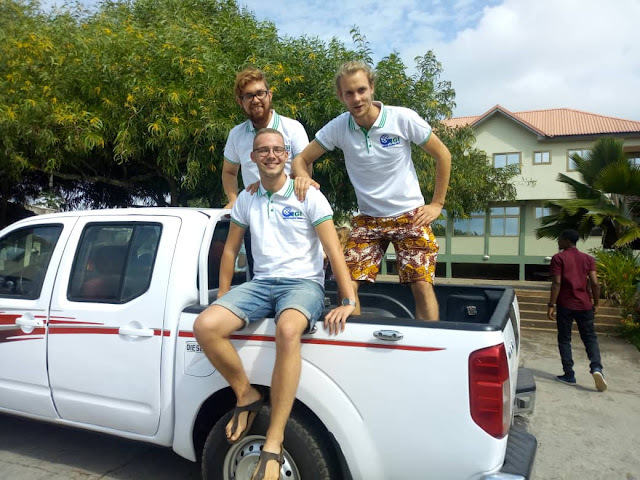 These volunteers are highly motivated after six days of orientation after their arrivals in August 2017. 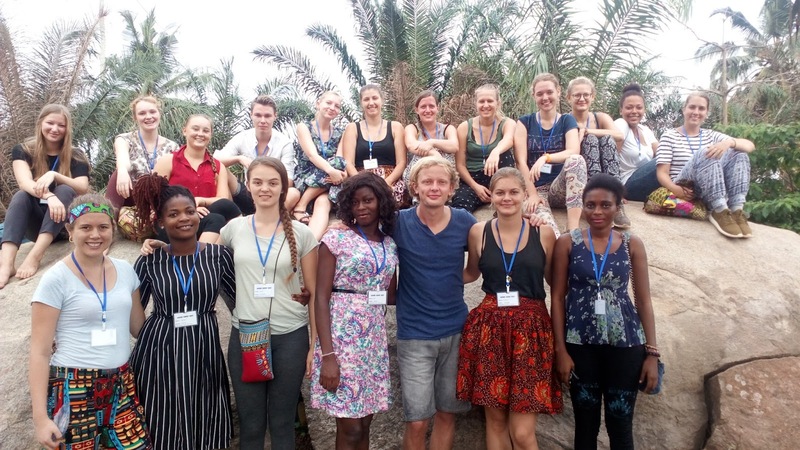 The orientations are used as preparatory seminars on topics such as the History, Political and Geography of Ghana, cultural issues, recreation and transportation among others. 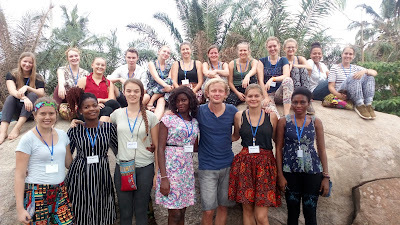 The orientations thus presented a great deal of opportunity for the volunteers to fully acquaint themselves with the realities of being volunteers in African cultures where everything might be so different. 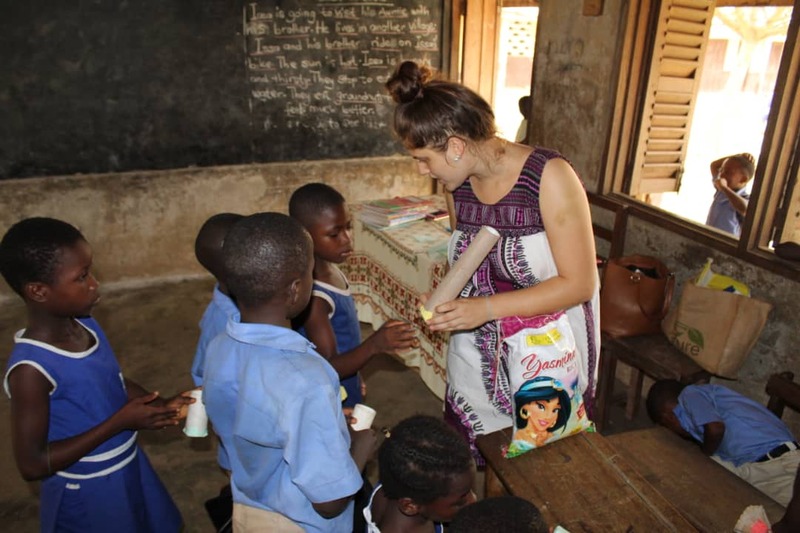 Since the placement in the various projects, the volunteers are mostly in schools having been teaching various projects as teaching assistants. Additionally, the volunteers have also been engaged with other activities at the schools. The pupils have been responding with love and affections for the volunteers, the reality of teaching in Ghanaian basic schools have been great experiences. They (volunteers) are always around many pupils in and out of class due to the fact that, most of the kids in the schools are for their first time encountering Europeans as their volunteer teachers. 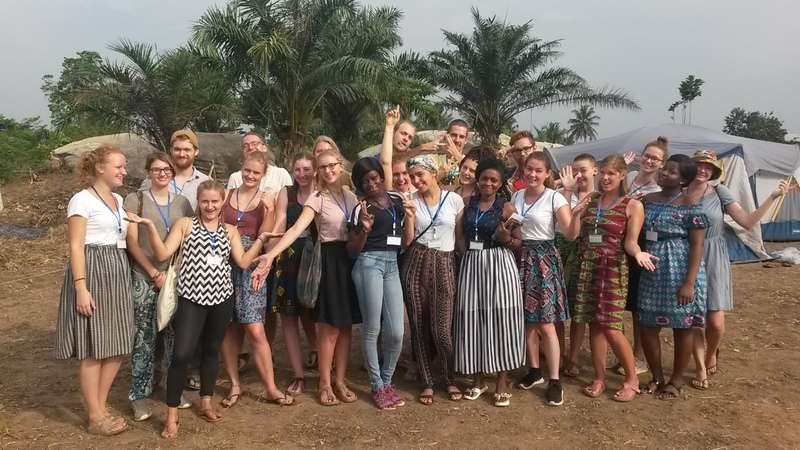 Apart from the school projects which have taken the better times of the volunteers, the volunteers have also made some trips to the IGI skills training village at Kwesikum in the Agona East District of the Central Region of Ghana. The skills training which is being developed into a training hub in dress making, shoe making, batik making, beads making as well as capacity training centre for youths and women is catching the attention of these volunteers in seeking sponsorships to build the needed infrastructure. So far, the volunteers are solidly behind IGI in the realization of the goal of giving skills training to youths in over hundred 100 villages in the enclave. Additionally, some of the volunteers have engaged the children from the villages in painting and writing activities in order to expose them to some European cultures which are necessary for the development of the children. IGI is so far extremely proud of the activities and the motivation of the volunteers in their projects and IGI activities. 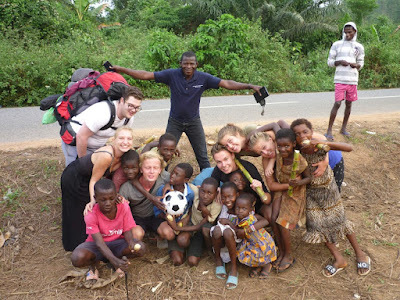 IGI strongly believes that the current volunteers under its management are poised to be actively part in the project Africa because the communities have themselves shown great signs of taking their destinies into their own hands to succeed. IGI and its volunteers are motivated to join these communities in the realization of their dreams of improving their livelihood. Our volunteers are indeed courageous. IGI - Building Community Assets!!! Waking up in a camping tent or a hut in rain forest could be unusual but to the IGI volunteers, the experience was so beautiful to keep. Walking in a dark community in the night and still see infectious smiles from community folks could not be better than. These were exactly how it happened at Kwesikum, a farming rain forest community in the Agona East District of the Central Region of Ghana. 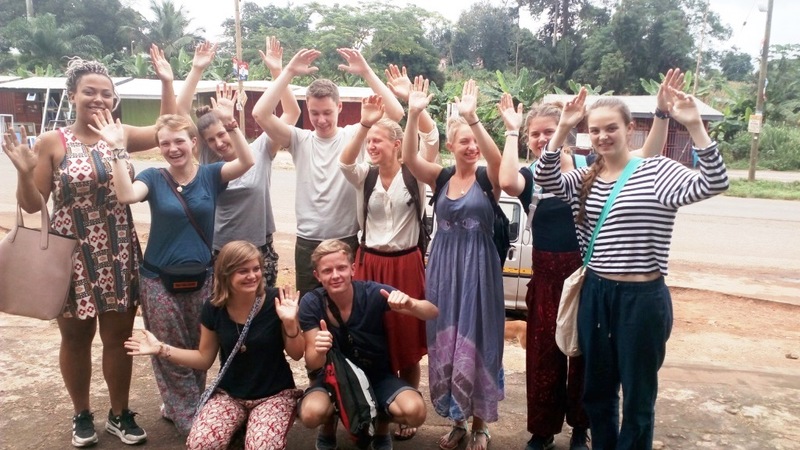 A youth work camp which was organised by IGI management offered both local and foreign volunteers numbering twenty (20) to stay in a rural community. 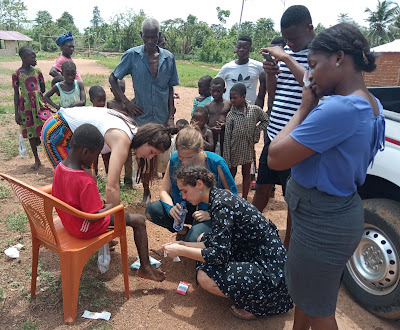 For a whole week, the volunteers were in community developments, taught in basic schools, worked in cocoa plantings, did health sensitization programmes and gave some health materials to the community folks. 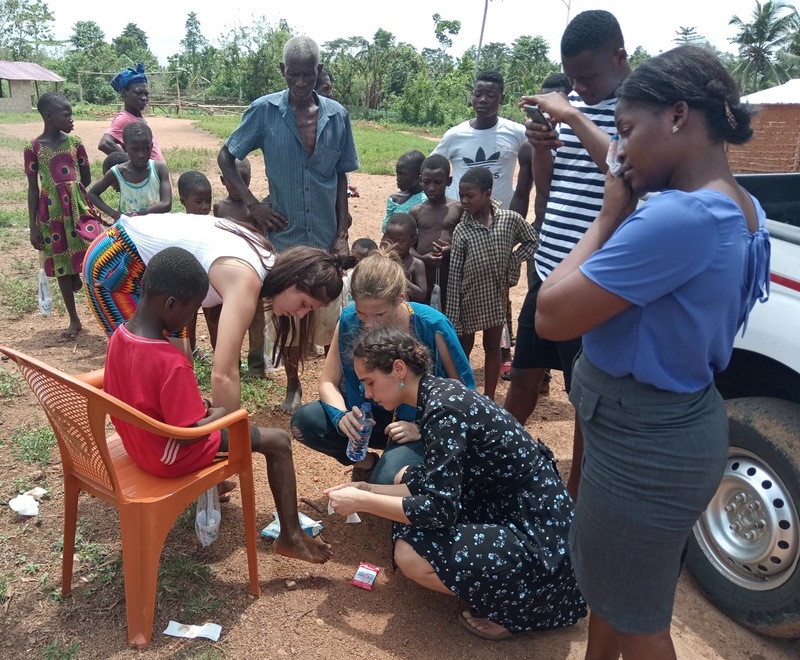 The work camp was sited at Kwesikum but volunteers taught in Duotu, Kwesi Pantsil and Duabone basic schools which were at least ten (10) minutes drive each from the camping site at Kwesikum. The schools especially the pupils and the teachers were extremely happy to have hosted the volunteers in their schools for the whole week. The pupils were excited to have listened, played and ate with the volunteers. To the pupils, though the experience was short, the memory will still stay with them for a long time. 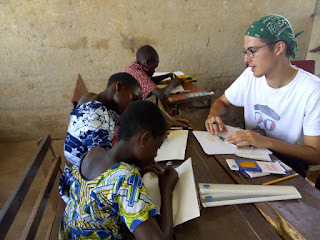 To the volunteers, teaching in these rural schools was such a big experience. 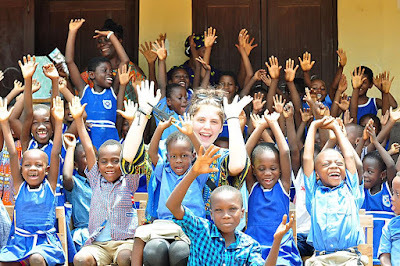 As they later expressed, the rural pupils to their surprise were more attentive in class than the urban school pupils where they currently teach. 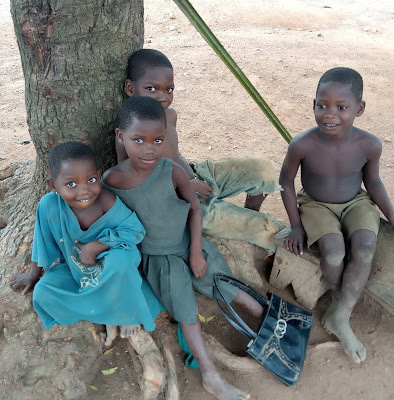 The volunteers were also thrilled that despite the long distances these pupils have to walk to their schools, they still walk to their respective schools. 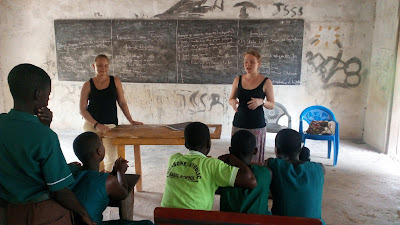 The volunteers appreciated also the schools for offering them the opportunity to learn from the pupils even as teachers. In the evenings, when most parts of the communities were virtually dark, the volunteers organised sensitization programmes on health issues, family life education and other pertinent issues for the community folks who attended the programmes in their numbers. Specifically, the sensitizations were done by individual presenters who were able to reach the audiences through an interpreter where necessary. The health topics were on; malaria prevention, teenage pregnancy, sexual reproductive education, and social welfare issues among others. The communities were really participatory as they were engaged by presenters by the aid of a projector. Through the sensitization programmes, the volunteers distributed mosquito nets to pregnant women, lactating mothers, children and the aged. The volunteers also worked in some cocoa farms on the Saturday, took part in a football competition between the basic schools teachers in the enclave and engaged in some cultural exchange activities with the children especially, for example, the volunteers were treated with some traditional dance and songs by some youths. 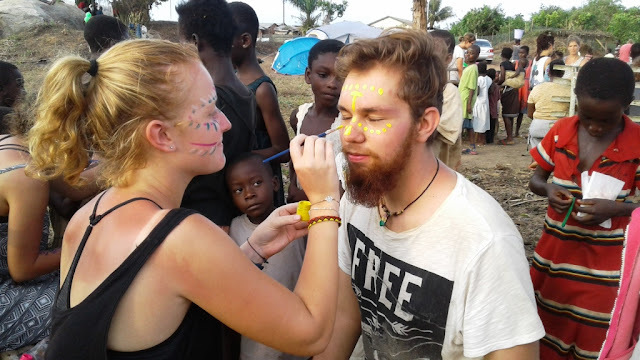 Certainly by the time, the camp officially ended on the Saturday, both volunteers and the kwesikum folks had enjoyed each others’ company and wished for another opportunity. Determined young people who are desirous of inspiring communities to reach out to positive change are always rare to find. Such young people who are selfless at heart and altruistic in nature mostly contribute their efforts into making the world a better place WITHOUT expecting any material gains as rewards. These volunteers usually derive happiness and satisfaction when their efforts bring out empowerment to the communities which are deprived. 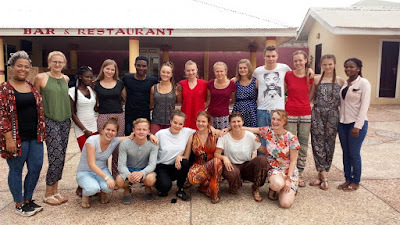 Certainly such rare young people are volunteers who have left the comfort and luxury back home in Europe but have opted to do voluntary activities in rural areas of Ghana. 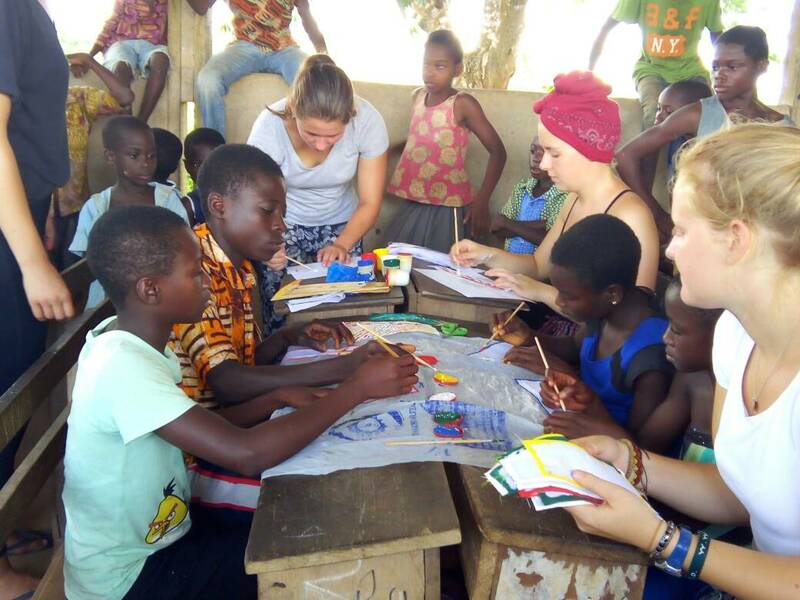 These volunteers are placed in some basic schools to teach, orphanages to provide child care and engage in rural communities’ activities. 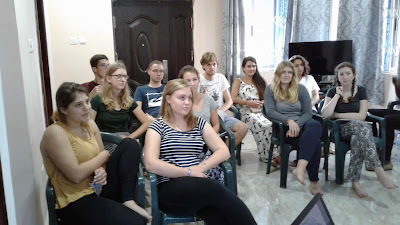 Some of these new volunteers, who arrived on the 13th August, 2015 were taken through a five (5) day orientation seminar organised by the IGI management team to prepare the volunteers adequately to be able to stay for the next twelve (12) months in an entirely different terrain, the volunteers were taken through presentations, role plays, games, excursions to important places and festivals among others. The specific topics covered were, Ghanaian cultures, Health & Safety Tips, Shopping & Transportation in Ghana, Crimes & Taboos in Ghana, Recreational & Tourist sites. Others were Project and Work Ethics, Host Family Stay, Visa issues among others. The volunteers expressed deep satisfaction after the orientation seminar and they remarked that, they were NOW ready to stay in Ghana for the next twelve (12) months. IGI indeed welcomes these courageous volunteers who have decided to be part of inspiring deprived communities to reach out to a change which gives oxygen to sustainable development. IGI boldly says AKWAABA to these volunteers and expresses its willingness to manage these volunteers to the best of its abilities throughout their stay in Ghana. IGI building communities assets !!! !